But before that can happen, a whole lot of knot tying needs to be done. 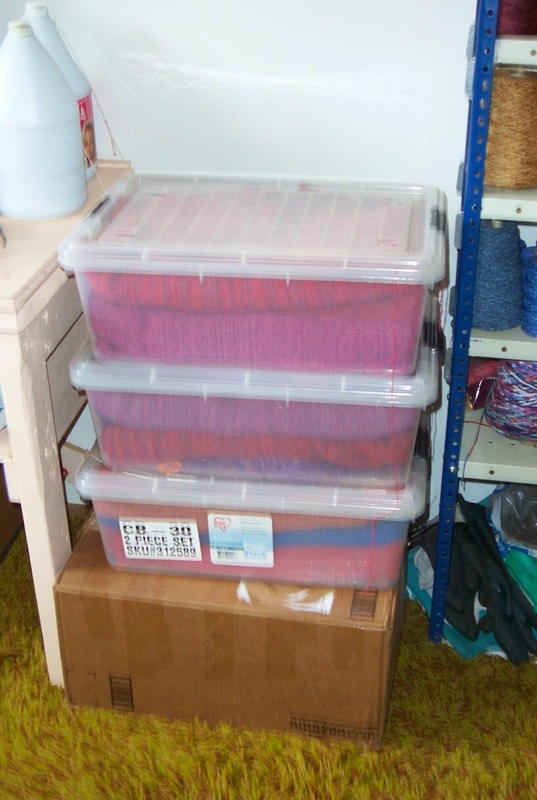 By my calculations I believe there are 28 shawls in these three bins to be tied. Doug has already done some sessions pressing what I've managed to get ready. Of course, once they are wet finished, they still have to be trimmed and tagged. However, the weaving part is now officially done. I cut the last warp off the loom a few minutes ago but before I begin on the AVL...it's lunch time. Or will be in a few minutes. Because when you are self-employed, you get to choose when to take breaks, right? This is it, the End of the Line. The Last of the Shawl Warps. #18 of 18. Just two more shawls to weave and put a period at the end of it. With the plateau I feel that it must surely be time to push the boundary a little bit harder. Having so many of these 'easy' warps to do meant that I stayed the course, did not start pushing too soon but stuck with the promise to myself that I would weave all of these 'gentle' warps before I tried weaving more normally, i.e. with the same degree of physical effort I'm used to using. As each warp came off the loom I found I could do a little bit more before I felt tired or achy, until with this one I didn't really feel any aches or pains at all. These warps fulfilled several functions: a) they allowed me to ease back into weaving, reminding my body very gently of the movements and effort I need it to perform; b) I was able to clear three boxes of yarn out of storage - about 150 four ounce skeins; c) build badly needing inventory - about 50+ shawls. All that needs to happen now is fringe tying, pressing, trimming and tagging. They will be ready in plenty of time for the fall sales beginning in October. This warp will come off tomorrow and then I will take a deep breath, turn the computer for the loom on and see just how far along in my recovery I really am. It seems a long time ago Kerstin and I were wending our way through the north of England and southern Scotland visiting every textile mill we could find. 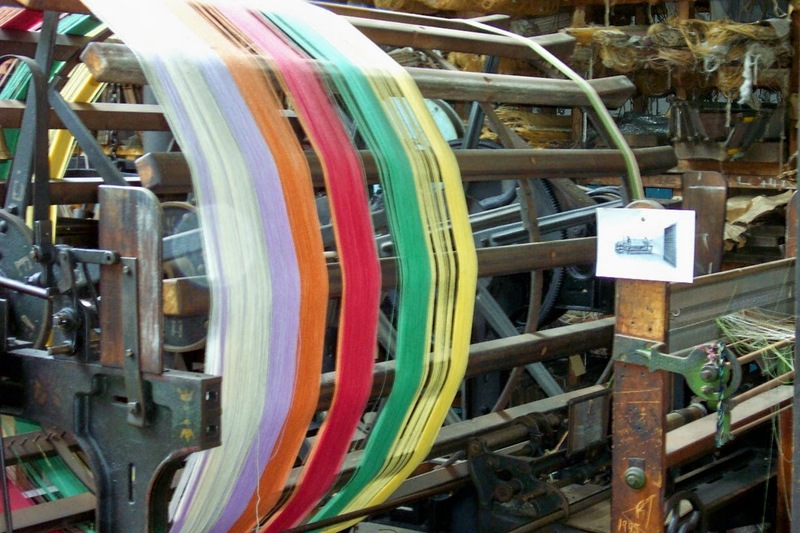 This photo is from Masson Mill and shows the rather large warp winding beam used by industry. I don't know how much traveling I will be doing in the future. Cutting back my teaching schedule means that I will be staying much closer to home. On the other hand, I have made so many friends across the border I would really like to go visit some of them, some of the time. So today I went and bought a one year travel medical insurance policy. I leave the province just often enough that it felt like it was going to be a lot more convenient to buy it by the year than to have to remember to go in for each and every trip, especially when some of the trips are less than a week in duration. Friends in Florida has issued a standing invitation to visit them during the winter, which after last winter is looking especially attractive. And of course there is Kerstin in Sweden, although that seems like an awfully long way to go with a back and hip that don't tolerate sitting for hours and hours very well anymore. I don't know if I will be able to drive long distances, either. But having the insurance policy is my optimistic vote that I will get to go somewhere, that my traveling days are not entirely history. Yet. Concentration was pretty thick in the air in the guild room this weekend! Eight enthusiastic students, exploring the nature of lace weaves. The guild room was stuffed. If there had been one more person, I think the room may have burst. As it was we were, um, cozy. Such a delight to see people understand the concepts and even go beyond to design their own patterns. Looking forward to seeing what they do with this knowledge. Over the years I have made a few things especially for me but I have kept very little. 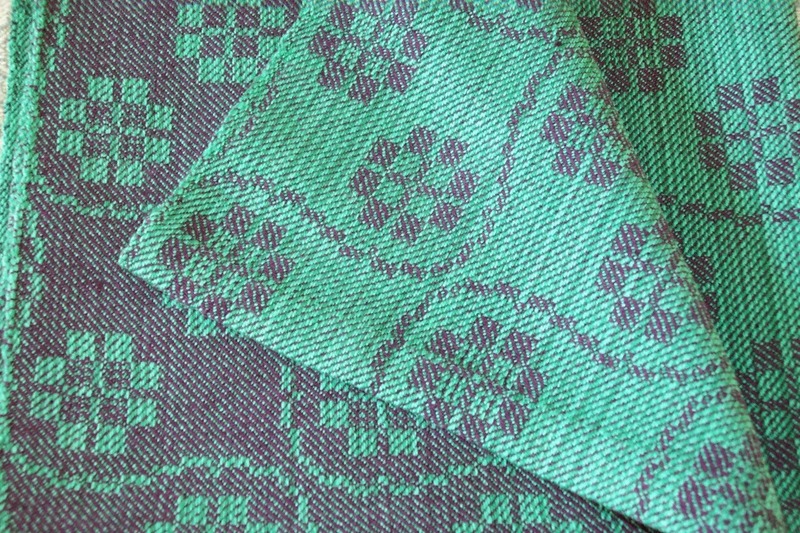 Many of the hand woven textiles I have in my home were actually woven by friends - mostly tea towels. I always recognize who made the towel du jour and I feel they are close to me, even though physically they may be very far away. I did keep most of the textiles woven for the master weaver certificate, although even those in some instances have found other homes. The silk scarf pictured above is one of the things I have kept. It was woven from 2/60 silk in Huck Lace. The butterflies (or moths - I can never keep them straight in my mind), flutter across the cloth as they will. 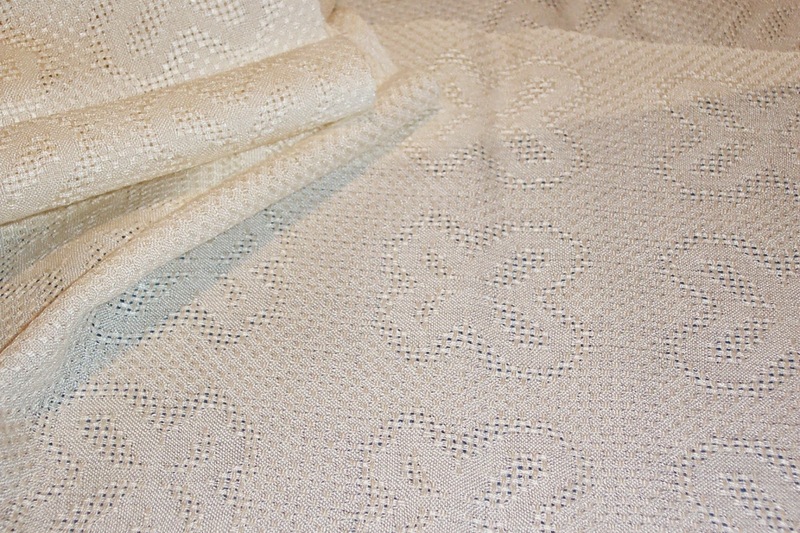 The cloth has areas of spots, lace and plain weave. It isn't perfect, but it's pretty close. It was a nice ramble down memory lane as I pulled examples for the workshop this weekend...and for the contract...more news on that once everything is settled. I know I've posted about this before but thought that it is time to revisit it because it is just so darned clever! Although I try to remove knots from the yarn as I wind a warp, sometimes they aren't obvious, or sometimes, as with this very textured yarn, the problem is not a knot, per se, but a a flaw in the spinning which creates a large lump. So it was with this warp...a large clump that snuck into the warp and which was not happy in the reed. The only solution was to 'cut it out'. What Kerstin does is thread a repair end into the same heddle as the culprit, weave for 2-3 cm, then cut out the bad end and continue weaving with just the repair end until the original is long enough to be brought back through the heddle, reed and pinned to the woven cloth. 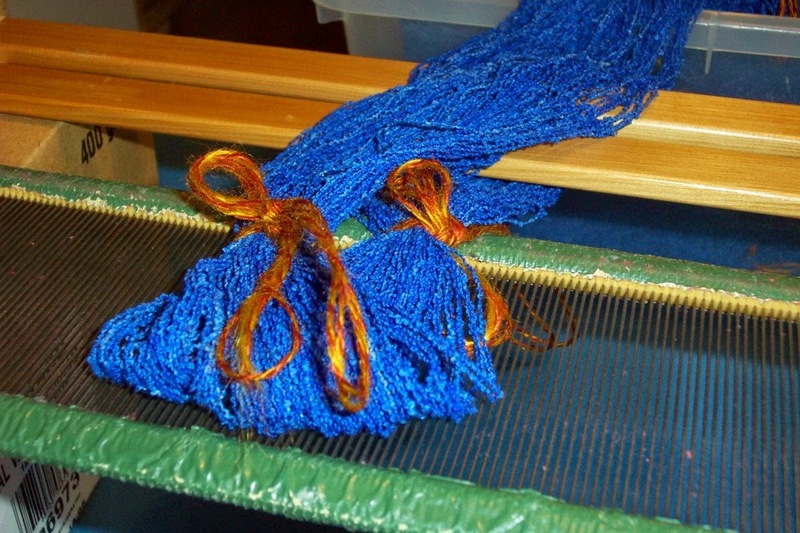 The beauty of this technique is that no needle weaving is required after the cloth is removed from the loom and with a yarn this textured, that is a real bonus! I purposefully kept the dregs left over from warp winding just in case I had to do any repairs and only on the 15th warp did I need to do this, but because I had it was a piece of cake to fix the problem. Check the video clip but essentially I take the loose end of the yarn, pass it up through the bottom of the cone and through the top. 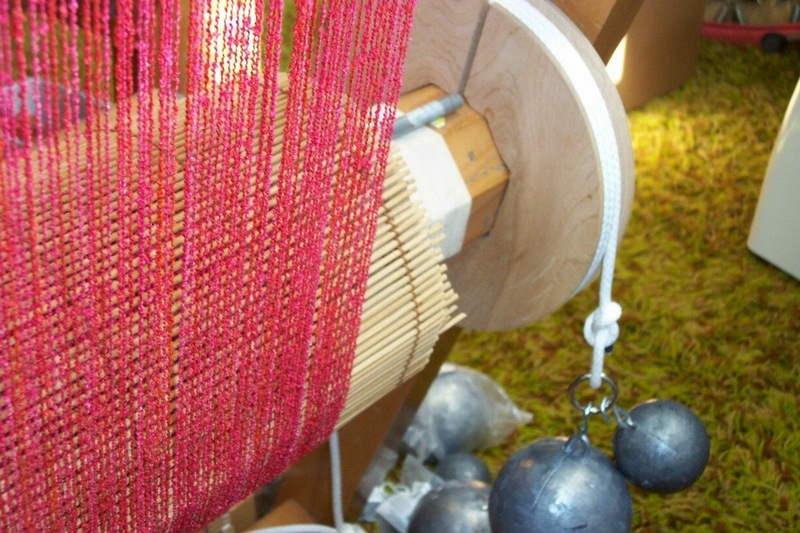 The weight of the cone is usually enough although weight can be added if you are weaving with higher tension than the cone provides. To lengthen the yarn when the cone rises to the back beam, it is a very simple matter to grab the yarn at the base and pull more yarn off the cone from the bottom. Our guild is extremely fortunate in that we have had our own room almost since we started. Unfortunately our membership roster is much smaller than it used to be, and the rent for the guild room never seems to go down, only up. Over the years we have done all sorts of things to raise funds for the rent...without continuously dipping into members pockets by raising membership fees. This year is the centenary of the city and the mascot of the city is a 'wooden' man, Mr. PG. He wears a hard hat in honour of all the people involved in the lumber industry. 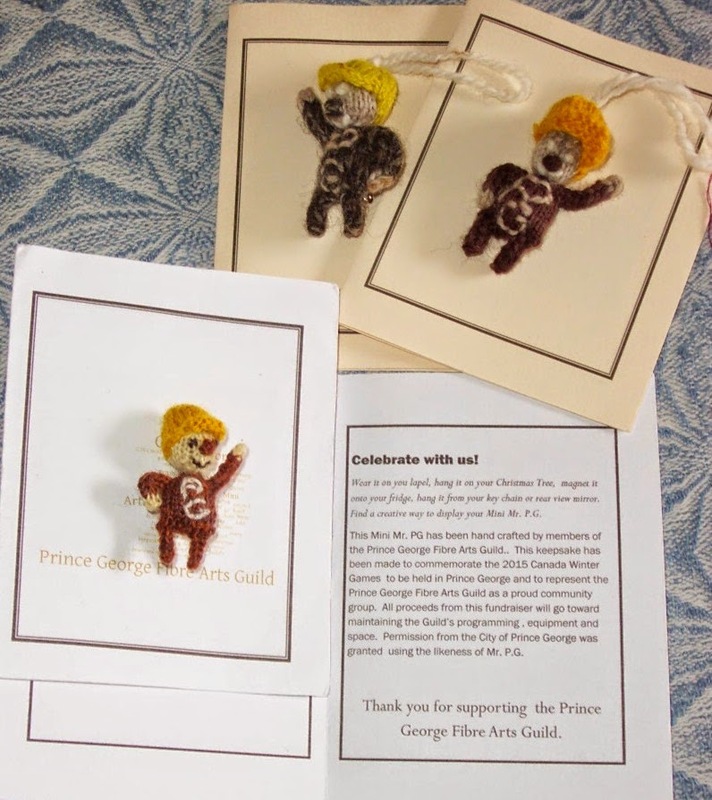 One of our guild members designed a knitted Mr. PG and various members made some which we are trying to sell in order to keep the roof over our head. They come as lapel pins or with a loop for hanging on your Christmas tree, loom, spinning wheel, whatever. They range in size from 1.5 to 2.5 inches, all are hand knitted with face and "PG" stitched by hand. We have about a dozen left and we would love to send them off to new homes. They are in the guild room and available for purchase for $20 during drop ins and Spring Fest aka the Great Chili Cook-off. Talking to someone from F&W Media yesterday I mentioned that I loved deadlines. She laughed and said she would send a schedule of deadlines related to the contract* we were discussing so that I would know when they needed my support materials. Thing is, deadlines and creative limitations can be extremely useful tools in the creative person's toolbox. Deadlines let me know how focused my attention and energy needs to be in order to get the job done when it needs doing. Creative limitations do the same sort of job but in a different way. When the sky is the limit in terms of possibilities, it can be overwhelming. Where to start? I remember that feeling of being overcome with the sheer number of possibilities when it comes to the creation of cloth. I rather suspect it is the same with all crafts. So, creative limitations. Some people don't like the concept of limitations because they feel it stifles their creativity. I am not that person. Rather than feeling stifled, I feel that the use of boundaries actually helps sharpen my focus in order to get me where I want to go. Sort of like Alice in Wonderland - if you don't know where you are going, any road will do. What do I mean by creative limitations? When deciding on what to make, the first question is...what am I going to make? As a 'form follows function' weaver, I need to know where I want to end up. By deciding on what function my desired textile is to fulfill, I now have a destination. Every decision I make from now on will - hopefully - get me there. Once I have decided what it is I want to make, I can now decide on dimensions. 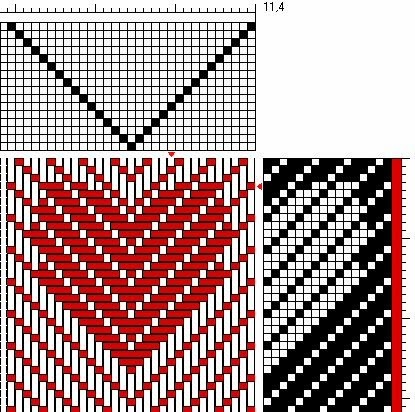 A functional textile will have an optimal size, within a spectrum - plus or minus x inches/centimeters long and wide. Then I have to decide on which fibre to use...cotton? linen? etc. After the fibre has been chosen, what grist (thickness) of yarn? Then how dense (epi/ppi)? Gradually, through a process of working within a set of boundaries, I begin to zero in on exactly what I am going to do. Once I have the technical issues sorted out I can begin working on the appearance of the cloth. What weave structure? Asymmetrical or symmetrical design? Charted out to the last thread or freeform? Colours? I may suddenly discover I don't have the colours I want to work with in my stash and need to order more yarn (tragedy! need to buy more yarn!) or I may set myself the challenge of working only with the yarns I have on hand. Usually a learning experience. So I welcome deadlines and I welcome creative limitations. Since I have only woven one shawl (one third of the warp) I'm only saying that the collar is looking promising. In order to determine if it is going to work the way I want it to, I need to finish this warp and see if it works well, right to the very end. I also need to put another warp on that requires higher tension. With a special order of six place mats needing to go on as soon as these shawls are complete, I should know fairly soon. When I looked at photos of older looms with the live weight tension system, they all seemed to have this much larger diameter collar for the cord to run around. I think it is because a better ratio between where the cord is holding tension and the diameter of the warp is required. The larger collar accomplishes a couple of things. One, it's round, not hexagonal so the cord has a smooth surface to slip on, not the hexagonal planes of the beam. Two, the much larger diameter means the cord has a lot more surface to grip and I think that is why so much less weight is needed. With the cord just wrapped around the beam, I was using 3 pounds on the 'light' end of the cord, 25 pounds on the 'heavy' end. With the collar, I've got 3 pounds on the 'light' end, but just 13 pounds on the heavy end. The result? Less effort required to advance the warp. I'm sure my neck/shoulder will thank me! But I need to finish this warp and see how the tension holds right from the beginning to the end. Plus how it works on a warp requiring much higher tension. The collar is actually larger than the diameter of the shawl warp which is 9 meters long, so it should allow my maximum warp length of 11 meters with no problems. The photos were taken at a conference in Victoria BC. When I was paging through the album - one of several I sorted through this morning at the guild room - I thought it was an ANWG conference, but now I'm thinking it was Victoria guild's 50th celebration or something. If anyone remembers, it would be fun to put a date to the photo. Anyway, sometime in the 80's near as I can recall. After all, I was obviously much younger, thinner and...a brunette...which I haven't been for a very long time. The garments were woven from Treenway's silk, 2/60. The butterfly jacket also had turquoise mylar as weft. The dress had mylar in one inch stripes. The top also had some mylar in it. Not a lot, mostly just on the edge of the cloth that became the neck/shoulder part. I sewed all the garments myself. I'm not a great seamstress, though and it's not my favourite thing to be doing. I'd much rather be weaving! The dress was a bit of a challenge because I sewed one inch pleats for the bodice which then opened up into the skirt. The dry cleaning bill about killed the household budget every time I wore it. Now it doesn't fit anymore, so it languishes in the back of my closet. One of these days I will recycle it - or give it to someone else to recyle. It's mostly silk, after all. The other day someone referred to me as being a 'traditional' weaver. 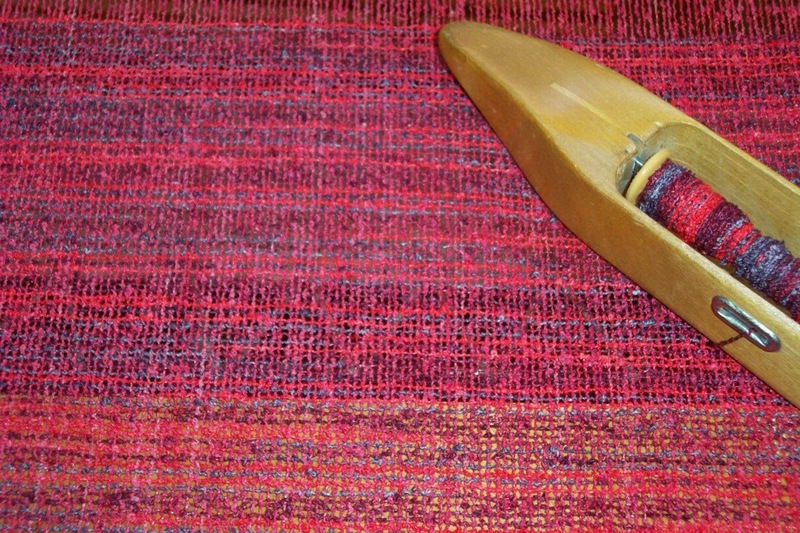 That description took me aback because for so many years of my career 'traditional' weavers refused me acceptance into the tribe based on my equipment choices and focus on efficiency. I was, after all, using a loom with dobby and fly shuttle and according to them, I could no longer call my textiles hand woven. It was the same when I added the computer interface, and again when I added air assist to the loom. So to be called 'traditional'? I had to think about that for a while. Eventually I realized that the word traditional, like most words, is open to interpretation by the person who is using it. On the one hand, my approach to weaving is to make cloth that will serve it's function well. I aim for consistent beat, tidy selvedges and a density that is appropriate for that cloth's purpose. On the other hand, I prefer to design my own drafts, not dip into the 'traditional' well - unless I do something 'different' like the overshot designs I turned into 4 block 16 shaft twill. Not the traditional approach, and one that is made easy for me because of my non-traditional equipment. I'm not adverse to free form design done 'well', it just isn't my personal approach to design. 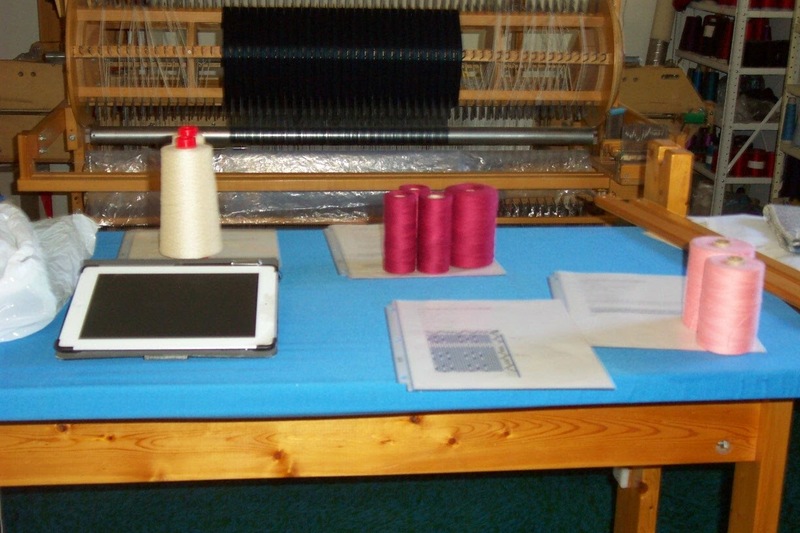 I do prefer loom controlled patterning because it is faster. I prefer finer, thinner threads because I like to make cloth that is finer...because thinner cloth will often perform it's intended function 'better' imho. Using finer threads allows me to have longer floats to create different designs. Having more shafts gives me more options for patterning, too, as in the heart design above. Woven in 2/16 or 2/20 cotton at 32 or 36 ends per inch, those 5 end floats are not a problem where they might be more of a problem at 8 ends per inch. So, yes, I am a 'traditional' weaver if the definition is that I want to make cloth that serves it's purpose well. I don't expect 'perfection' from anyone, not my students nor myself. But I do expect that people will at least try to make cloth that has structural integrity. But in the end? That's just my opinion, just my approach. Everyone is entitled to their own approach, their own definition. And when that definition doesn't match mine? Well, that's my problem, not theirs. Imagine my surprise when I opened the last issue of Handwoven and spotted this full page ad! The ad doesn't say it's a dvd, and I had been wondering about the recent inquiries about my 'book'...now I know! My heart has been warmed by the positive reviews I've seen on line. My hope when I did this dvd was to try to help people with the weaving process. 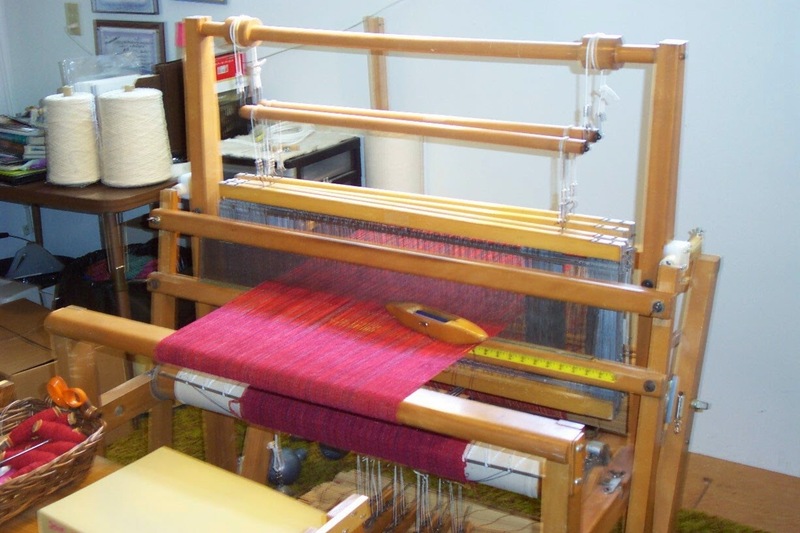 Over the years I've heard so many people lament that dressing the loom is a struggle, or that they have suffered repetitive stress injuries that prevented them from weaving. I knew that a lot of this was simply due to using techniques or processes that could be made more efficient, more ergonomic. Again, not quite true to life. The woven cloth looks very 'pink' on my monitor when it's actually an orange/coral, more like the yarn in the shuttle. The cone on the left is about the same colour but a lighter value, while the cone on the right is pretty close although it looks a bit on the lavender end of the colour chart. In using up this yarn I had an assortment of 'odd' colours left over. It's been a bit of a challenge at times to find appropriate combinations but since they were all dyed with the same brand of dyes, they are going together much better than I'd hoped. 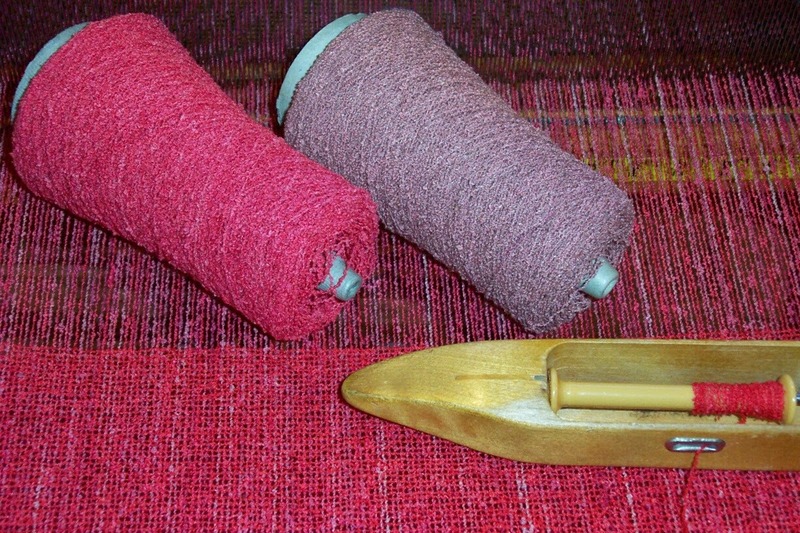 The pale cone is nearly the same as the lighter bits in the warp so it should just be a pastel version. Or at least, that's what I'm hoping. More good news - there are now seven people who want to take the Lace Workshop. I could possibly take one more, but with two brand new weavers in the class and several who haven't woven for a while and need a refresher, I think that seven will be plenty. The Beginning Weaving workshop already has one person who is interested but needs to check her work schedule before she signs up. After so many years of not being able to run a beginning class because no one was interested, it is very heartening to see interest in weaving picking up again. The colours in this photo are pretty true to life on my monitor. 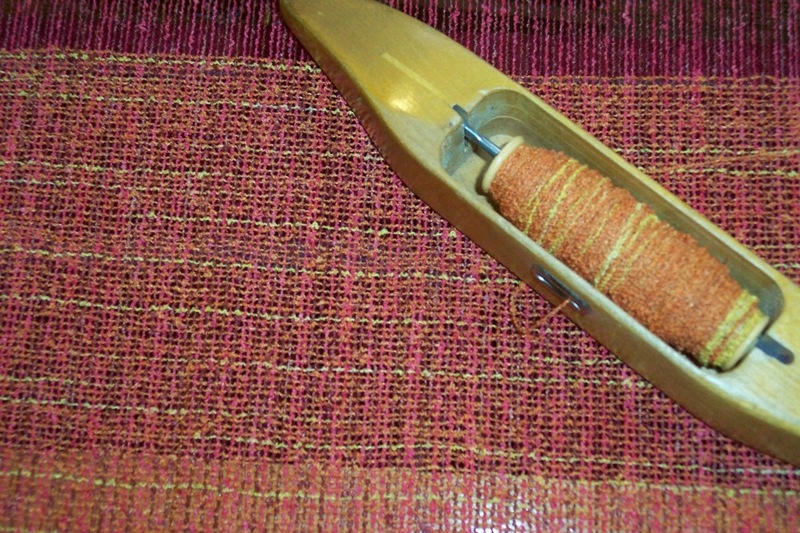 The warp is a coral and kind of brick red, the weft a sort of pumpkin orange with a fairly bright yellow. Not too much yellow because a little yellow goes a long way. Let me be perfectly clear. Orange appears in my personal colour palette...no where. It's not my choice of colours. It doesn't sing to me. At all. But that doesn't stop me from weaving with it. Why? Because although I only weave stuff I want to, I'm not weaving textiles exclusively for my use. 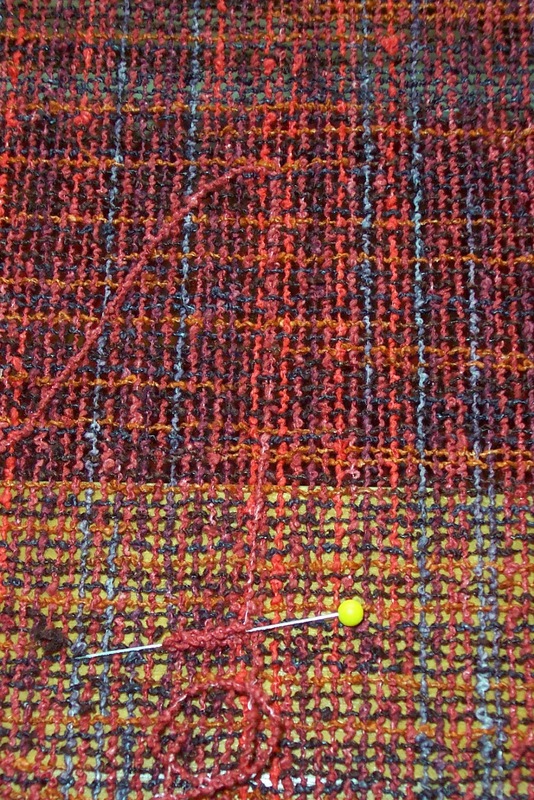 So I weave with orange and yellow and brown and all sorts of shades of beige, not because I want those textiles for myself but because I enjoy weaving and I enjoy making things that other people like and want in their lives. So I weave with these colours and do my level best to make them as beautiful...and as beautifully...as I possibly can. By selling my textiles I can afford to buy more yarn. More yarn means I can weave more stuff. And every time I push myself to work with those colours that don't sing to me? I learn. I learn more about how colours go together, which ones will play nicely, and which ones don't. I had about 4 cones of this textured yarn in various colours that got put with different warps several times as I mulled over which of these 'odd' colours were going to be able to be used with the warps I had wound. I think this single orange skein/cone got moved to four different warps before I finally decided that this warp was the one it would play nicely with. In the end I'm satisfied I made the correct choice. Now if the other dubious cones play as nicely with their assigned warps, I will be truly happy. Sometimes you just don't know what you are going to get until you start weaving. So it was with this yarn as weft. In the skein and on the cone it wasn't particularly appealing to the eye. The pale areas were so very pale in comparison to the darker it looks quite jarring. But I was short of yarns that would go on this dark blue warp so I threw caution to the wind and wound the bobbins. Again, colours aren't quite true to life but you can see how the variegated sections move through the cloth in a nice undulation. Sometimes variegated yarns have colours that 'pool' unattractively. This time I think they look quite interesting, and I'm pleased with this shawl. The other two are going to be woven with two different shades of blue in what I call a 'semi-solid' and they are much 'safer' so I know they'll be fine. No surprises, pleasant or otherwise. Currently reading Ghost Boy by M. Pistorius. Officially at the half way point as I begin to set up warp #9 on the great stash busting count down from 18. 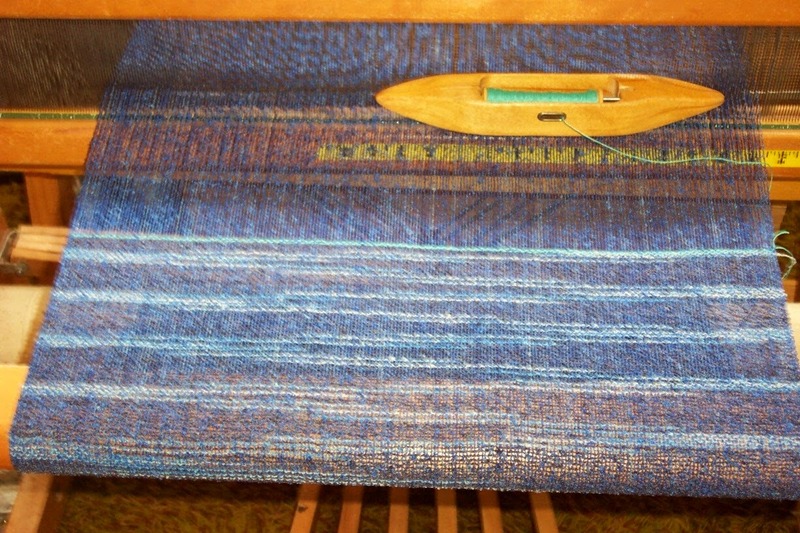 This is the only blue warp in the run, which is a pity because I know I could sell a lot more than three blue shawls. But the point of the exercise is to use up what I have and what I most had was a bunch of coral/rust reds. So I will have depth of stock in those, some purple/pinks, a couple of magenta and a couple of turquoise warps. I'm trying to break up the coral/red warps by weaving other colours in between. Someone asked me if the very open weave I'm doing with this yarn will result in a stable cloth. It is stable enough for shawls/scarves. It won't survive getting caught in a zipper or snagged on a necklace or bracelet. But most textiles won't, either. 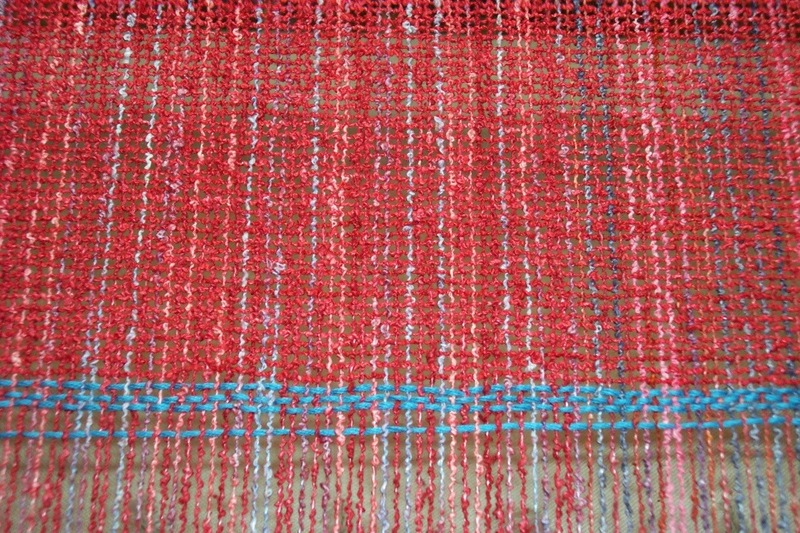 One of my primary aims as a weaver is to make cloth which will fulfill it's function. The yarn as mentioned previously is a highly twisted lower quality silk. As such it is matt not slippery and the corkscrew twists of the yarn help to catch and grab onto the threads crossing each other. That, combined with a good hard press, helps to lock the threads into place. So while it is possible to disturb the threads from their path, there is sufficient stability for the job the cloth is intended for. At least in my opinion. Again, not quite accurate to life...the orange is much brighter, more like the orange in the shuttle. This is, in the count down from #18, warp #10. When I finish weaving this warp I will be half way through the shawl warps. And that much closer to recovery. The exercises the physio gave me are beginning to do their work and I have less discomfort from protesting muscles and am beginning to feel stronger. I even tested myself on a small hill on Wednesday and managed fairly well. I can tell how out of shape I've gotten over the past few months, but the nice thing about muscles is that as you use them, they do get stronger. I mentioned in the last post that I take private students. Generally people come for 3 to 5 days and they work on the more subtle aspects of weaving, working to improve their physical skills, looking at issues of ergonomics. Essentially most of the content covered in the dvd The Efficient Weaver, but personalized. It's really hard to see yourself from the back for instance, so difficult to see if posture is good, if there are bad habits that might lead to repetitive stress injuries and so on. People can either stay with me in our very modest house, or take a room at a nearby motel which is clean and fairly quiet and reasonably cheap. Tuition is currently $100 per day plus an additional $25 per day if staying with us. One student came with her husband who explored the area around the town while she was in the studio. If you like hiking or the outdoors, we've got plenty. Lakes and rivers abound, wildlife never seems to be far away (although no guarantees) plus there are other attractions, like Barkerville. At one time it was the largest city north of San Francisco as gold prospectors flooded the area with the discovery of gold in the 1800's. One thing though, this summer we are hoping to get some work done on the house so it might be a bit of a construction zone. But the studio will still be here. 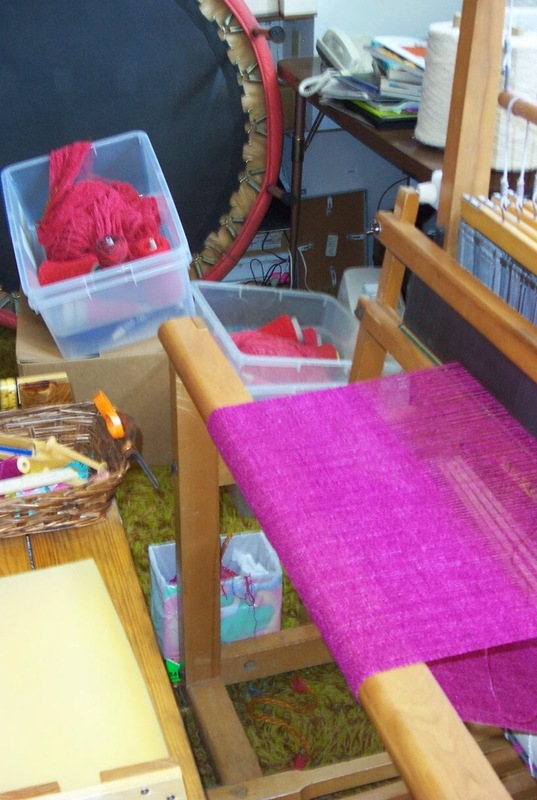 And it looks like there might be a Beginning Weaving Workshop here at the guild room May 23/24. One of the things about procrastination...it makes critical deadlines happen. I needed to have at least one draft ready by the guild meeting tonight so I started out by selecting the warps for the workshop, then wound the silk warp for one of the two people registered. The benefit of teaching locally is 1) the guild looms can be used and 2) I get to decide how many - or few - people I'm willing to teach. I had hoped for more than two, but on the other hand, guild members who weave haven't had much in the way of programs or workshops lately, so I decided that I would run it with just two people. If nothing else, those two will learn more about lace weaves. During the times they are weaving and don't need my assistance, I can be knotting fringes on the shawls I've gotten woven. It was a tough decision but I think I'm pretty comfortable with it now. I've applied for both (tiny) pensions I'm entitled to which will give me a monthly income - something I've not had in pretty close to 40 years and I made the decision to become a full time weaver. It's been an education, being self-employed. One of the first things I learned was that I was not going to have a 'regular' income. The cyclical nature of the feast/famine economy of a self-employed artisan has been challenging, to say the least. I won't miss the struggle to find income to cover the bills. I will miss teaching, the personal interaction with new enthusiastic weavers. But I can still take private students and from time to time, run a local workshop. Anyone want to come to PG in April? Spring has finally arrived! 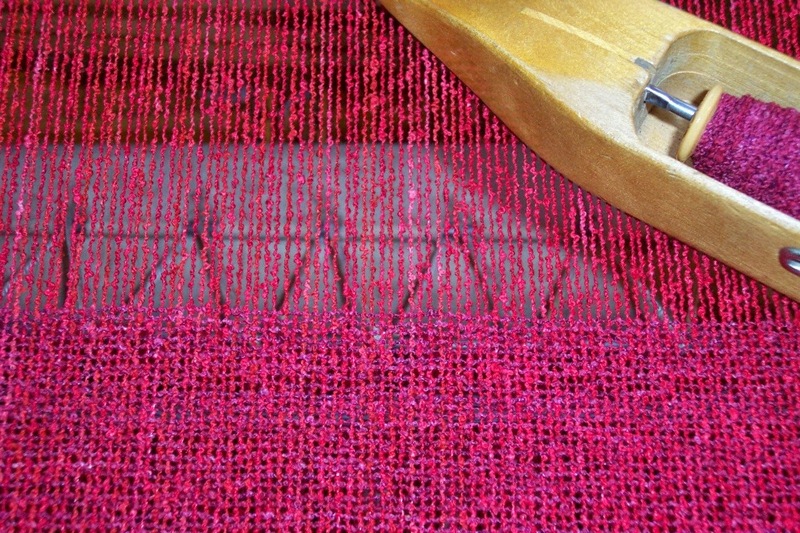 The warp on the loom is actually a darker magenta. I have three shades of magenta to use as weft; this is the darkest of the three. The other two will look more like this does in the photo. We appear to have achieved spring at last, although the temps continue to be on the chilly side. We are supposed to have sunny days for most of this week so the flowers should start bursting out of the ground. One of the purposes of this shawl run - other than to increase my inventory of shawls, of course - is to use up this textured silk yarn. Each warp takes four cones (four oz each), then each shawl takes one cone for weft. I was getting down to the dregs when I wound this warp. I had two cones of the same terracotta semi-solid, plus two cones that had the same terracotta, but different shades of grey. I agonized over it for a while, then decided that it didn't matter if one side of the shawl had a lighter shade than the other. In fact, a customer might like the wearing options this would create. By folding or twisting the shawl, it would have a different look to it. So I went ahead and wound the warp using up the two co-ordinated but slightly different variegated yarns. I actually think it's going to look just fine. The blue is 'waste' yarn that will hold the yarns in place until I can get the knots tied. Just two more warps to wind. The first batch of shawls are being wet finished today and Doug will start pressing tomorrow. I've woven enough warps now, which are in various stages of 'finishing' that it's getting harder to keep track of the woven ones, and much easier to see how many warps are left. So I'm now officially counting down from 18. This is #13 on the countdown. 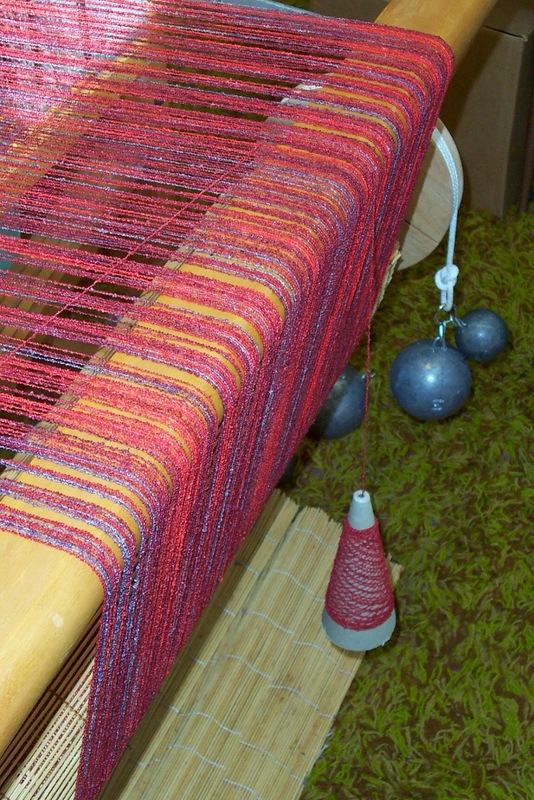 There are three more warps to be wound, all of them various shades of coral reds. 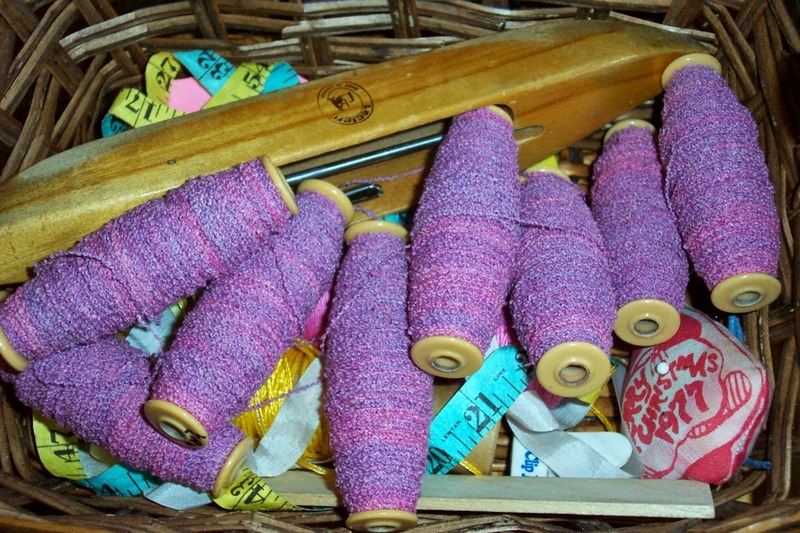 There are a few cones that are going to be left over - not enough of any one colour to make another warp. They will go into my knitting stash. Seems like there is no end of yarns that are too much to throw away, too little to weave with. I bundle strands together and knit with them. But knitting is so much slooooower than weaving, it seems like I've got the same sort of problem with the knitting as I do with the weaving! Too much yarn for the time available. That said, I need to put in a yarn order. I know. Hardly seems credible that I would with one breath complain I have too much yarn and with the very next say I need to order more. But it's true. For a good deal of the yarn I have on hand, I need to order more yarn in in order to use it up. And that's why my stash never seems to grow smaller! I've never really liked April Fool's pranks, so April Spools suits me much better. Bobbins wound for the last of the shawls on the Deep Purple Haze warp, now woven. Tomorrow I will dress the loom with the next warp, #6. Or maybe I should be counting down?